HappyFox allows you to create or update assets in bulk by importing spreadsheets containing asset fields and their corresponding values. This article covers the general guidelines on importing assets. Available in Enterprise and above pricing plan. A managerial permission "Manage Import Assets" governs the visibility of "Asset Import" page. Contact your helpdesk admin to enable this. Make sure you have your desired asset custom fields created beforehand. Learn more about Asset Custom Fields here. Cross-verify the list of dropdown and multi-choice asset field values with the ones in the records you plan to import. HappyFox supports importing assets from CSV spreadsheet file format. You can import only one spreadsheet at a time. The first row of the CSV file should contain the asset fields. They can be in any order. The asset fields are case-sensitive - please ensure fields in the spreadsheet are an exact match with the ones on HappyFox. By default, "NAME" and "DISPLAY ID" are mandatory. Make sure your CSV has this column. DISPLAY ID acts as the "primary key" for your assets. Ensure it is unique for each record. The subsequent rows should contain the value for the respective asset fields. To avoid errors while import, ensure all your required asset fields have their values defined in the spreadsheet. Here's a sample CSV file which is import ready. The first row is highlighted for reference. For Multi-Choice asset fields, ensure the field values are comma separated (If need be). Go to Assets >> Assets Import from module switcher. Click "Choose file to upload". From the file browser, select the spreadsheet you would like to import. Click "Begin Import" to initiate the import process. 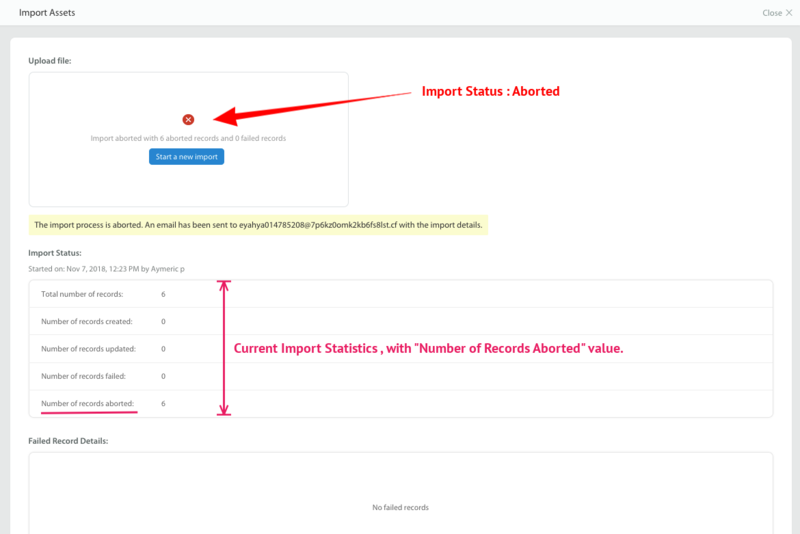 The Import Status gets refreshed for every 100 records during the import process. 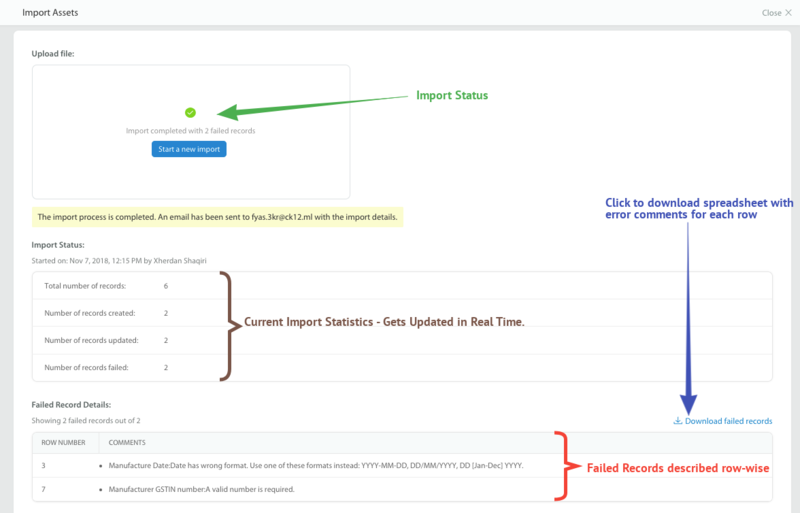 Once the import is completed, you get the detailed import status along with the error report. You also have the option to download a CSV file with error comments appended at the end of each row for reference. An email with the import details link in the description will be sent to your email id once the import is done. Q) What happens if I abort my asset import? A: If you abort your ongoing import, all the records prior to the abort will get created/updated. The subsequent records post the abort will not get created or updated. An e-mail will be sent to your mail id with the link to the aborted import details.